As thousands of South Africans have taken to the streets on Friday in anti-Zuma protests across the nation, another economic disaster hit the country. Following S&P’s downgrade earlier this week, Fitch announced on Friday afternoon that it has also cut South Africa to sub-investment grade. With two out of the three major rating agencies having South Africa at sub-investment grade, this means that the country is now firmly in junk status. Moody’s has also put South Africa on review with a decision being imminent. These are dangerous times for South Africa, especially as an impotent ANC is seemingly disinterested in acting against its number one. Daily, the crisis in South Africa is deepening and Nelson Mandela’s dream of a prosperous nation is fading by the second. While marches will signal South Africans’ unhappiness with the situation, the reality is that life won’t change at the bottom tip of Africa until Zuma is gone. And times are about to get a lot tougher… – Gareth van Zyl. 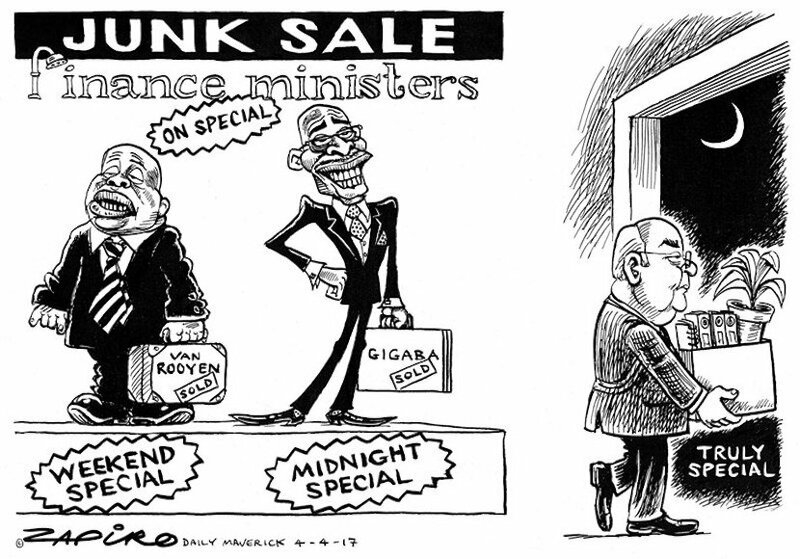 Bloomberg – South African debt got dealt a second blow in a week as Fitch Ratings Ltd. joined S&P Global Ratings and cut the nation’s credit assessment to junk following President Jacob Zuma’s move to fire a well-respected finance minister. Fitch reduced the foreign-currency rating to BB+, the highest non-investment grade, the company said in a statement on Friday, four days after S&P reduced its assessment. The local-currency rating was also lowered one level to junk. The outlook is stable. Zuma fired Finance Minister Pravin Gordhan, who pushed for budget restraint, in a cabinet reshuffle on March 31, igniting South Africa’s worst political crisis in almost a decade and sparking calls from top officials for him to resign. Investors regard the firing as a blow to an economy growing at the slowest pace since a 2009 recession and grappling with 27 percent unemployment and the rand and bonds plunged. Zuma doesn’t understand how his actions can influence decisions by rating companies, and his actions showed a “recklessness” that ruined South Africa’s credibility, former President Kgalema Motlanthe said in an April 3 interview. Pressure within the ruling African National Congress has been growing for Zuma to step down after he recalled Gordhan from a trade trip in London March 27. The former minister was holding meetings with investors and ratings companies. The president replaced Gordhan with former Home Affairs Minister Malusi Gigaba, who has no financial or business experience, making him the nation’s fourth finance minister in 15 months. Both the South African Communist Party and the Congress of South African Trade Unions, the country’s biggest labor federation, have called on Zuma to resign, as has a group of the ANC’s veteran members. The rand, which had been the world’s best-performing currency in 2017 until the March 27 recall, has now erased all its gains this year for the biggest decline among more than 140 currencies monitored by Bloomberg. The rand decreased 0.6 percent to 13.8370 per dollar at 1:38 p.m. in Johannesburg. The Fitch cut came as thousands of people gathered across the country to demand that Zuma resign. The protests were called by Save South Africa, which has been campaigning for better government, and are backed by the main opposition party, the Democratic Alliance, and civil-rights groups. 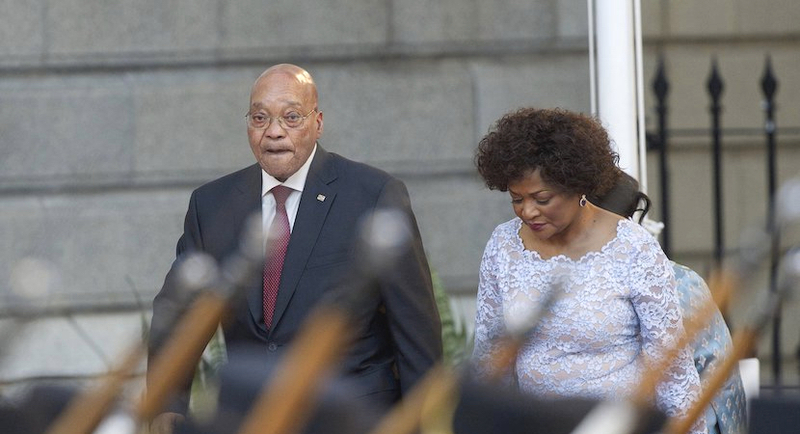 Zuma, 74, will face a no-confidence motion in parliament on April 18 sponsored by opposition parties. The ruling ANC said its members won’t vote against the president, whose decision to change the cabinet was criticized by three senior members of the party, including Deputy President Cyril Ramaphosa. Zuma, who’s due to step down as ANC leader in December and as the nation’s president in 2019, has survived a series of corruption scandals and presided over the party’s worst-electoral performance since the end of apartheid in 1994 in municipal elections in August. Moody’s Investors Service put its Baa2 assessment, which is two levels above junk, on review for a downgrade on April 3. Fitch Ratings-Hong Kong-07 April 2017: Fitch Ratings has downgraded South Africa’s Long-Term Foreign- and Local-Currency Issuer Default Ratings (IDRs) to ‘BB+’ from ‘BBB-‘. The Outlooks are Stable. The issue ratings on South Africa’s senior unsecured foreign- and local-currency bonds have been downgraded to ‘BB+’ from ‘BBB-‘. The rating on the sukuk trust certificates issued by RSA Sukuk No. 1 Trust has also been downgraded to ‘BB+’ from ‘BBB-‘, in line with South Africa’s Long-Term Foreign-Currency IDR. The Short-Term Foreign-and Local-Currency IDRs and the rating on the short-term local-currency securities have been downgraded to ‘B’ from ‘F3’. The Country Ceiling has been revised down to ‘BBB-‘ from ‘BBB’. The downgrade of South Africa’s Long-Term IDRs reflects Fitch’s view that recent political events, including a major cabinet reshuffle, will weaken standards of governance and public finances. 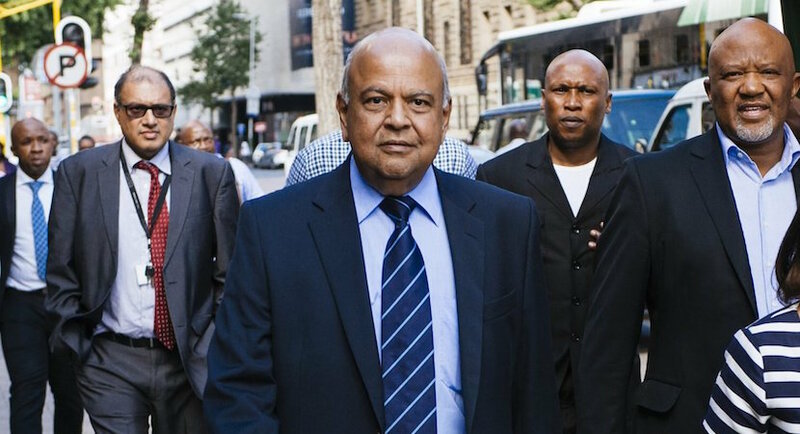 In Fitch’s view, the cabinet reshuffle, which involved the replacement of the finance minister, Pravin Gordhan, and the deputy finance minister, Mcebisi Jonas, is likely to result in a change in the direction of economic policy. The reshuffle partly reflected efforts by the out-going finance minister to improve the governance of state-owned enterprises (SOEs). The reshuffle is likely to undermine, if not reverse, progress in SOE governance, raising the risk that SOE debt could migrate onto the government’s balance sheet. Differences over the country’s expensive nuclear programme preceded the dismissal of a previous finance minister, Nhlanhla Nene, in December 2015 and in Fitch’s view may have also contributed to the decision for the recent reshuffle. Under the new cabinet, including a new energy minister, the programme is likely to move relatively quickly. The state-owned electricity company, Eskom, has already issued a request for information for nuclear suppliers and is expected to issue a request for proposals for nuclear power stations later this year. 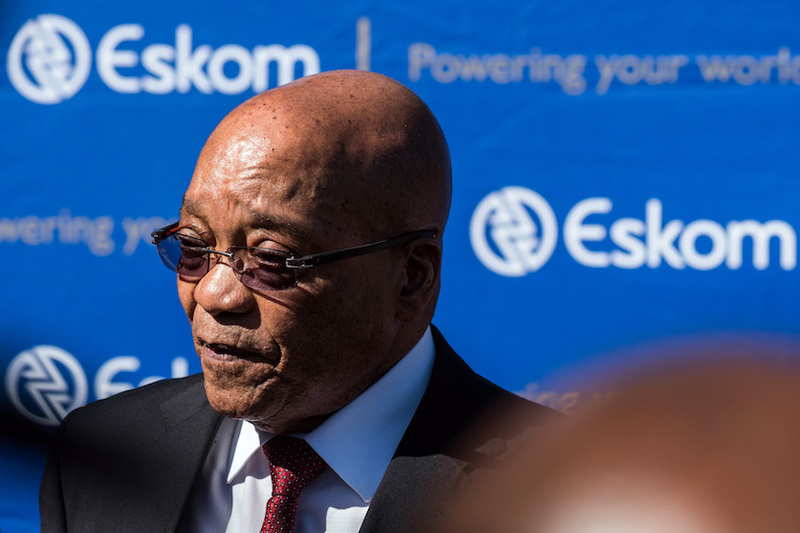 The treasury under its previous leadership had said that Eskom could not absorb the nuclear programme with its current approved guarantees, so the treasury will likely have to substantially increase guarantees to Eskom. This would increase contingent liabilities, which are already sizeable. According to the 2017/18 budget, the government’s guarantee exposure to public institutions was ZAR308.3 billion at end-March 2017, up from ZAR255.8 billion a year earlier. The main SOEs had additional liabilities of ZAR463 billion in 2016 with no explicit guarantee but with a significant probability that the government would step in should SOEs be unable to service the debt. The government has repeatedly needed to support SOEs, including Eskom, which is responsible for a large share of liabilities. The new finance minister has stated that he does not intend to change fiscal policy and remains committed to expenditure ceilings that have been a pillar of fiscal consolidation. However, Fitch believes that following the government reshuffle, fiscal consolidation will be less of a priority given the president’s focus on “radical socioeconomic transformation”. This means that renewed shortfalls in revenues, for example as a result of lower than expected GDP growth, are less likely to be compensated by expenditure and revenue measures. This could put upward pressure on general government debt, which at an estimated 53% of GDP at end-March 2017 was already slightly above the ‘BB’ category median of 51%. The tensions within the ANC will mean that political energy will be absorbed by efforts to maintain party unity and fend off leadership challenges and to placate rising social pressures for addressing inequality, poverty and weak public service delivery. The Treasury’s ability to withstand departmental demands for increased spending may also weaken. Political uncertainty was already an important factor behind weak growth last year, as in Fitch’s assessment it has affected the willingness of companies to invest. The agency believes that the cabinet reshuffle will further undermine the investment climate. Fitch forecasts GDP growth of 1.2% in 2017 and 2.1% in 2018, but the reshuffle has raised downside risks. The current account deficit narrowed to 3.3% of GDP in 2016 from 4.4% in 2015, on the back of import compression reflecting weak domestic demand, low oil prices and increasing investment income from abroad. This improvement, together with the flexible exchange rate, will contain pressures should external financing dry up. The government’s low reliance on foreign-currency financing, which accounted for just 11.3% of debt at end-March 2017, is also helping to contain external pressures. Most indicators of economic development are in line with ‘BB’ category medians. GDP per capita at market prices is estimated at USD5,207 for 2016, compared with a median of USD5,007. The World Bank’s governance indicator, at the 59th percentile, is well above the ‘BB’ median and more in line with the ‘BBB’ median. However, this may not adequately reflect governance issues that were highlighted in the recent state of capture report by the public prosecutor and governance may deteriorate as a result of the reshuffle. The rating is supported by a sound banking sector, which has a Fitch Bank Systemic Risk Indicator of ‘bbb’. Fitch’s proprietary SRM assigns South Africa a score equivalent to a rating of ‘BBB’ on the Long-Term FC IDR scale. – Macroeconomic Performance, Policies and Prospect: -1 notch, to reflect South Africa’s weak growth prospects relative to the ‘BBB’ category median, with important repercussions for public finances. – Structural Features: -1 notch, to reflect the expected deterioration in governance standards, particularly related to SOEs. Fitch’s SRM is the agency’s proprietary multiple regression rating model that employs 18 variables based on three year centred averages, including one year of forecasts, to produce a score equivalent to a LT FC IDR. Fitch’s QO is a forward-looking qualitative framework designed to allow for adjustment to the SRM output to assign the final rating, reflecting factors within our criteria that are not fully quantifiable and/or not fully reflected in the SRM. – A failure to stabilise the government debt/GDP ratio or an increase in contingent liabilities. – Failure of GDP growth to recover sustainably, for example, due to sustained uncertainty about economic policy. – Rising net external debt to levels that raise the potential for serious financing strains. – An improvement in governance standards that is supportive of a stronger business and investment climate and a sustained upturn in economic growth. – A marked narrowing in the budget deficit and a reduction in the government debt/GDP ratio. – An improvement in the country’s net external debt/GDP ratio. Fitch expects global economic trends and commodity prices to develop as outlined in Fitch’s March Global Economic Outlook. Fitch Ratings (Fitch) has downgraded government’s long-term foreign and local currency debt to ‘BB+’ from ‘BBB-‘ with a stable outlook, a non-investment grade Rating. The announcement by Fitch is noted by government and while it is a setback, government remains committed to making sure that its work with business, labour and the civil society continues in order to improve the business confidence and implement structural reforms to accelerate inclusive economic growth. This downgrade reflects Fitch’s view that recent political events, including a major cabinet reshuffle, will weaken standards of governance and public finances. In the agency’s view, the cabinet reshuffle is likely to result in a change in the direction of economic policy, to undermine progress in state-owned companies’ governance, raising the risk that the contingent liabilities associated with these entities are realised and increase the prospect of a substantial increased issuance of guarantees in respect of a nuclear build programme. The fiscal policy trajectory outlined in Budget 2017. Implementing reforms to improve governance in state-owned companies. Maintaining the expenditure ceiling and ensuring the stabilization of government Debt. Ensuring that Nuclear procurement will be transparent and implemented at a scale and pace that the country can afford. Fast-tracking the implementation of structural reforms aimed at boosting economic growth as contained in the 9-point plan. To this end, and as acknowledged by Fitch economic growth is expected to be higher this year than in 2016 then rising further over the medium-term. We urge all South Africans to remain positive and continue to work hard in turning this economy around. This country has tremendous potential, by working together we can make South Africa an increasingly attractive investment destination.